This article explains the Hofstede Cultural Dimensions, developed by Geert Hofstede in a practical way. After reading you will understand the basics of this powerful organization cultural analysis tool. Globalization is still a familiar concept today. All kinds of technological developments enable people to communicate with each other throughout the world and this also applies to organizations. Globalization, communication and organizations are therefore accompanied by different cultures. People who work in international business may be taken by surprise when they learn how people behave in different cultures. According to Geert Hofstede culture is more often a source of conflict than of synergy. In order to bridge the differences Geert Hofstede started a large survey study within the IBM organization in 56 countries in 1970. His survey study has provided us with an insight into other countries and cultures, especially with respect to effective interactions between people. After more than 1.000 interviews and a variety of angles, the model of the Hofstede Cultural Dimensions emerged. Initially, four dimensions were identified; later a fifth was added to the Hofstede Cultural Dimensions. In successive studies these Hofstede Cultural Dimensions were identified for 76 countries. Each country has a scale from 1 to 100 for each dimension. The higher the score, the more the dimension in question emerges in the culture. 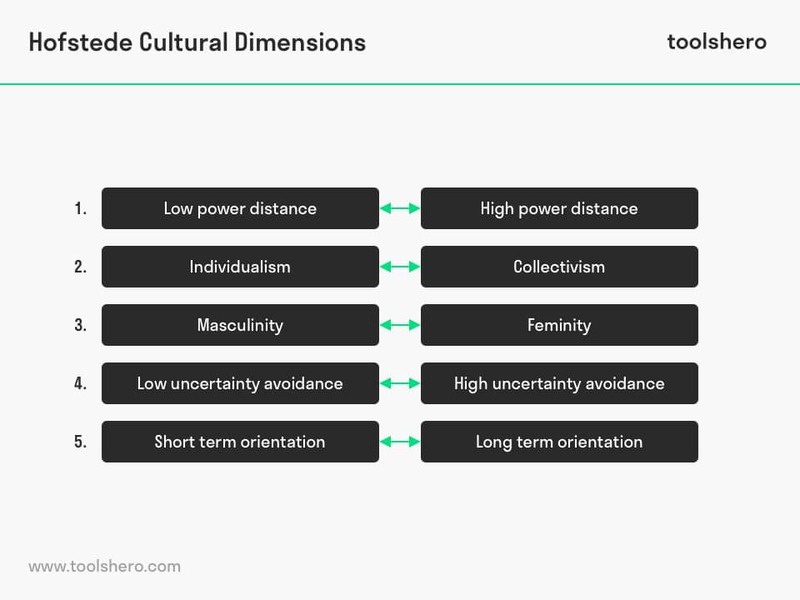 The Hofstede Cultural Dimensions are set out in a structural model using a versus construction. The definition of power distance (Power Distance Index (PDI)) within the Hofstede Cultural Dimensions refers to the measure of inequality that exists- and is accepted – by people with and without power. This represents the inequality (high versus low), but in the sense of acceptance. A high PDI score indicates that a high power distance can be observed in which the conclusion can be drawn that there is great inequality in society (culture). Strong hierarchical relationships, displays of little respect and authority can be traced back to most Asian countries. A low score represents a low power distance. Here equality can be perceived and this can mainly be traced back to European countries. The definition of Individualism (IDV) within the Hofstede Cultural Dimensions refers to the strength of the mutual ties between individuals within a certain community. A high score represents ‘loose‘ (lack of interpersonal) connections and little sharing of responsibility. The individuals value people’s time and their need for freedom highly. Respect for privacy and expectations of rewards for hard work are also characteristics of a high score. A society with a low score (more collectivism) would have a strong group cohesion, a large amount of loyalty and respect for members within a certain community. The emphasis is on developing skills and becoming a kind of ‘guru’, master or expert of something. Working for intrinsic rewards is also an important characteristic. Harmony is more important than honesty. This definition (Masculinity – MAS) within the Hofstede Cultural Dimensions refers to how much a society complies with its values and traditional male and female roles. For men the emphasis is on performance and success whereas for women the emphasis is on modesty, sensitivity and the quality of life. In high scores men are masculine (tough, strong and assertive) and women are feminine (submissive, subservient and kind). In Low MAS scoring countries, the distinction between the roles is not transparent. Women also work in male-dominated professions, there is much cooperation and men are allowed to be sensitive and kind. In addition, powerful and successful women are admired and respected. The definition of ‘uncertainty‘ (Uncertainty/Avoidance Index – UAI) within the Hofstede Cultural Dimensions refers to the degree of anxiety that society members feel when they are faced with uncertain and unknown situations. High scoring nations avoid uncertain situations through control (rules and order). They seek a collective truth to which they link expectations with a certain degree of security. Low scoring nations enjoy, for example, new events and initiatives. People have an informal attitude, and they accept change and risk. This dimension refers to society rules based on traditions and centuries-old traditions. These apply to both the short and the long term. The following characteristics can be perceived in high scoring nations: family is the basis of society, education and training are highly valued and elderly people and men have more authority than young people and women. This is especially perceived in Asian countries. Low scoring countries promote high creativity and individualism. People treat each other as equals and they are willing to help each other execute the most innovative plans and ideas. What do you think? Are the Hofstede Cultural Dimensions still applicable in today’s modern economy and global companies? Do you recognize the practical explanation or do you have more additions? What are your success factors for a good Hofstede Cultural Dimensions study? Hofstede, G. & Bond, M. H. (1984). Hofstede’s Culture Dimensions An Independent Validation Using Rokeach’s Value Survey. Journal of cross-cultural psychology, 15(4), 417-433. Hofstede, G. & Hofstede, G. J. (2005). Cultures and Organizations: Software of the Mind. McGraw Hill.